Google has announced the addition of more than 125 Ultra HD movies to the Google Play store, including Star Trek Beyond, The Secret Life of Pets, Ghostbusters, and Captain Phillips. Google Play uses the same VP9 compression scheme as YouTube to stream 4K content, and compatible playback devices currently include the Chromecast Ultra, Sony Bravia UHD Android TVs, and the Xiaomi Mi Box 3. The company also announced the addition of the Google Play Movies & TV app to 2016 Samsung smart TVs. When we first made movies available on Android (a little over five years ago), they were only available on Android devices in the U.S., and you could only rent movies from three major studios. Today, Google Play Movies & TV is the most broadly available digital seller of movies & TV shows, with movies now available in 117 countries. And whether you're watching on your laptop, at home on your TV, or on the go on a phone or tablet, we've got you covered. We've also added support for watching on iOS devices, via Chromecast on just about any TV, on your Roku streaming box, and on select Smart TVs. 4K Ultra HD - Google Play Movies now offers more than 125 movies in 4K resolution, using VP9, so that you can enjoy them in the highest quality. 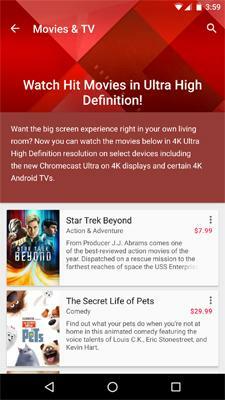 Starting in the U.S. and Canada, you can purchase 4K movies on your Android device or on the web and stream them on your Chromecast Ultra, your Sony Bravia Android TV, or your Xiaomi Mi Box 3. And for anyone who buys a new Chromecast 4K Ultra, your first 4K movie is on us! Choose from select titles, including Ghostbusters and Captain Phillips. Google Play Movies & TV on VR - In October, we launched Google Play Movies & TV together with the Daydream VR platform, so you can now watch all the movies and TV shows in your Google Play library in a virtual cinema, even if you're offline. Still building your library? Take a virtual tour of our selection of new release movies, next day TV shows, and more than 10,000 catalog titles; or buy on your phone to watch later using your Daydream VR headset. 2016 Samsung TVs - The Google Play Movies & TV app is now available on 2016 model Samsung Smart TVs, which means that movies and TV shows already in your library are immediately available to watch directly on your new Samsung Smart TV. Or use your TV's remote to browse our selection of new release movies and next-day TV shows and start watching something new right away. With Google Play's vast catalog of new releases and next day TV shows, you can explore the final frontier of space in Star Trek Beyond, fight zombies in The Walking Dead, or travel back in time to another age in Downton Abbey. And now with 4K streaming and VR viewing, you have even more ways to bring movies to life in ways you've never before experienced. • Google Launches Its Own Voice Assistant: Google Home at HometheaterReview.com. • VIZIO Gets Heavily Into Google Cast with New UHD TVs and Audio Gear at HomeTheaterReview.com.